Loosely-related anecdote: I was watching the Kennedy Center honors performances in honor of Sting on You Tube the other day and Lady Gaga performed one of my favorite tunes from the man: "If I Ever Lose My Faith in You." The only way I can sum up her performance is to say that it was embarrassing. Talk about a performance with absolutely no sense of restraint or style. This was all capped with her ridiculous idea to keep screaming, all through the chorus, "It stings..." (oh, that's clever) while reaching so hard with her eyes and upper body toward Sting in the upper balcony that I thought she was going to fall into the tuxedoed laps in the front row. Deperate and chaotically loud is no way to go through life. 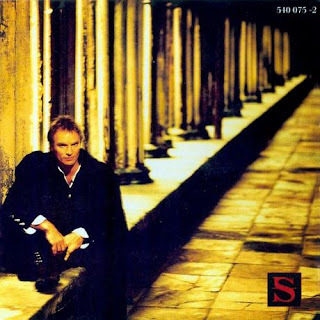 Be that as it may, Sting has always been one of my musical, lyrical and artistic role models since my teenaged years. (I think, i ntime, his lyrics, at least, will survive.) It all got me to thinking about the role models we pick and it got me wondering why some people reach high and some reach low for their role models. ...because, beyond my dad, it was always people who were the best at what they did that I looked up to. It was never coaches or teachers; it was always artists, poets, musicians of the highest caliber. As a kid, I had posters of both Ted Williams and Shakespeare on my wall (I still have a framed poster of the first folio frontispiece in my living room). The impetus was never to show off or to be pretentious, but to remind myself of how great a person can become at what he does; maybe there was a hope that I could climb three rungs on Shakespeare's ten-thousand rung ladder... However it is read by those on the outside, the sentiment was sincere. My heroes have always been the standouts in world history. I am curious as to how that happens; whether it was an accident; how I can encourage my kids to reach toward the greats and not toward the flavor of the day. One thing I know is that to watch that Lady Gaga's performance of one of the most delicately balanced, lyrically compelling pop songs of all time; watching her turn it into a literal, three minute vomiting of desperate pleas for acceptance sure give us a good scale for separating the wheat from the chaff. I hope my sons reach as high as I always did. (Which means higher than they are likely to reach.) That's all.